The persistent slump in the Japanese economy has accelerated. Reuters: - Sentiment among Japanese manufacturers fell for a fourth straight month, a Reuters poll showed, providing more evidence that the world's third-biggest economy is slipping into recession amid a global slowdown and tensions with China [ see discussion ]. The monthly poll, which closely correlates with the Bank of Japan's quarterly tankan survey, comes after data this week showed the economy shrank 0.9 percent in July-September, the first contraction in three quarters. Sentiment among non-manufacturers including retailers and construction firms tumbled in November after holding steady this year, a sign that private consumption is losing momentum after a recovery led by rebuilding from last year's earthquake and tsunami. A slew of weak data is likely to keep the central bank under pressure to ease monetary policy further after having boosted monetary stimulus for a second straight month in October as a strong yen and weak global demand threatened the export-reliant economy. But politicians always come to the rescue. Except rather than focusing on structural issues plaguing Japan, Shinzo Abe, the likely next prime minister of the nation, wants to use BOJ as a direct lender to the government. Of course he is not the first politician in recent months to use a nation's central bank to solve structural problems (such as excessive government debt). WSJ: - Japan's main opposition leader Shinzo Abe said Saturday he would consider having the Bank of Japan underwrite construction bonds, a type of Japanese government debt, once he returns to power, Kyodo News reported. "Money will be forced to go out to the market by (the government) having the BOJ buy construction bonds directly if possible," Abe said regarding steps to overcome deflation during a speech in the southern Japanese city of Kumamoto, according to the report. Construction bonds are issued by the government to finance infrastructure projects. 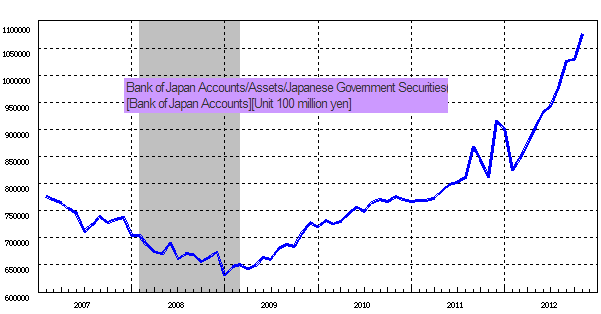 This new effort may make the recent QE efforts by BOJ (chart below) seem small in comparison. The strategy is working even before the election, as the yen, already weakened by Japan's fundamentals, is getting clobbered. In practice, this is as much about construction bonds as it is about a "currency war". The new prime minister may be looking to further weaken the yen in order to revive the export sector. Of course printed money going to Japan's construction firms (see discussion) would be a wonderful side effect. 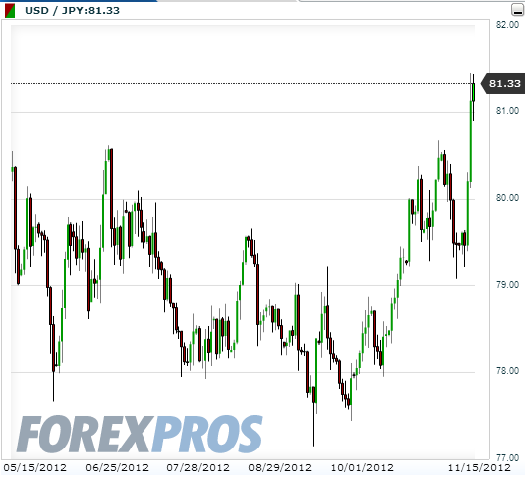 GS: - Potential for unprecedented political pressure on BOJ from the December election: ... In a scenario where LDP [Abe's party] regains its position as the party with the greatest number of seats, with Abe becoming prime minister, and with the economy visibly weakening, we expect the government would call on the BOJ for further easing based on the joint government-BOJ statement issued on October 30. Another central bank is about to lose any semblance of independence to become a tool used to win elections and provide cheap money to the government.